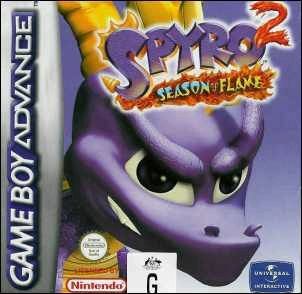 Following on from the first title on GBA called Spyro: Season of Ice, Season of Flame makes it way onto the GameBoy Advance. Being one of my favourite titles on the Playstation, I was initially nervous about the translation to the GBA. However it was well done and the game was more than enjoyable. So, what has been done in this incarnation of the game? 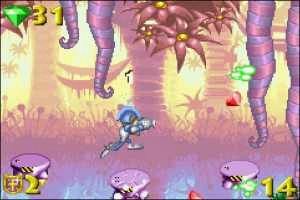 As far as appearances go, not a lot seems to have changed with the layout very similar to the first adventure, almost to the point that the same colour palette seems to have been used. 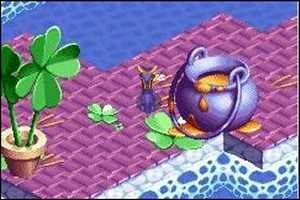 The graphics are very well realised, it all just looks so similar though. Then the game starts in earnest and you can immediately tell where the improvements have been made. In particular the control on Season of Flame is wonderful and then some. One of my gripes last time round was that Spyro couldn't always be accurately moved around the screen and there would be unnecessary deaths through no fault of the player. This has been done away with in this version and I am pleased to report that you can manoeuvre characters with ease. That's right, I said characters. 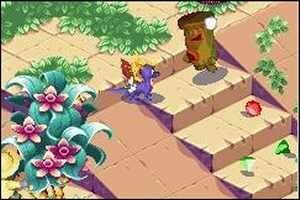 This time around there is more than just Spyro who needs a hand. The storyline follows directly from Season of Ice and there is a little catchup sequence that will clue players in who did not play that game the first time round. Those pesky Rhynocs are back again and they have stolen all the fireflies from the Dragon Realms, making it impossible for all the dragons, including Spyro to breathe fire. Spyro can however breathe a gust of ice that he can use to great effect. He also has his old attack of the headbutt though this is the only attack where you can go off a cliff by accident as he builds up a lot of speed during his charge. A cool feature of the game is that this time you can access a full screen map of where Spyro has been before by pushing L and Select at the same time. Due to the size of the levels this is a nice touch. I would say to fans of the series that you will enjoy this game as a lot of extra time and effort has gone into the title. It's not a must have title by any means, but for several hours distraction and as a good stocking filler you could certainly do worse.